After gaining some experience growing plants in general during my teens my gardening interest seemed to gravitate toward flowers as an adult. 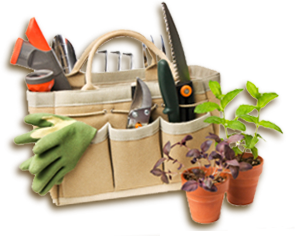 The more I read and learned about this aspect of gardening the more I found out how much thought and research it takes to come up with a plan for a professional looking flower garden. One of the biggest challenges that I still wrestle with today is mixing different colored flowers together to create just the right combinations. The colors that are sometimes the most challenging and the most rewarding are orange and red. There is no doubt that orange and red flowers make a bold statement. Whether they are grown in the sun or the shade they can stand out on their own without even needing the assistance of a contrasting color such as yellow or white. You can find orange and red flowers for damp soil that would be near a pond or stream or for dry soil that you would find in a rock garden. No matter what garden zone you are located in there is a red or orange flower that you can grow. As far as I am concerned nothing says summer more than the color orange. Daylilies, Cosmos, and Zinnias, are just a few of my favorite orange flowers. While Orange is one of my favorite colors a garden of just orange flowers would be a little too overwhelming to my eyes and perhaps a little boring after a while. A better way to enjoy your orange flowers is by combining it with other colors. 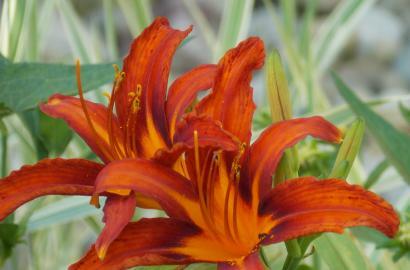 Try combining orange flowers with white or blue companions and you’ll see that the orange flower stands out even more. The color red is also an attention getter. I can’t tell you how many compliments I’ve had from neighbors drawn to the red rose that is trained on the lamp post in my front yard. It is also an early bloomer here in the Mid-Atlantic and something about a red rose blooming in Mid-May says spring has arrived! Some have described red as a color of excitement and if you want to catch someone’s interest the color red is a great way to do that. Some of my favorite red flowers are Knockout Roses which you can buy from us or at your local garden center, Blanket Flower also known as Gaillardia and Cardinal Flower which is a useful plant that thrives in the moist soil found in many shady areas. Even if you’re a beginner you can create powerful color combinations in your flower garden. While it is fun to come up with your own ideas there is also nothing wrong with trying to recreate what you’ve seen elsewhere. 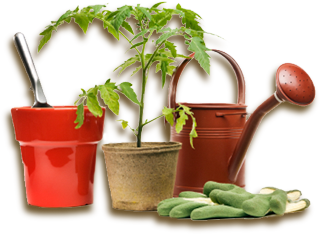 For example, I discovered gardening as a hobby during trips my family would take to Disney World. Seeing the beautiful flowers and the colorful combinations that were displayed inspired me to try gardening for myself and hopefully, this article will help you do the same thing. If you have a color combination you would like to share with us please visit our Facebook page so we can all try to recreate the beauty that you’ve created!